These winter rolls are the cousin of summer rolls but with autumnal and winter produce served with a raw spicy dip. A rainbow of winter fruit and vegetables with a fresh zesty sauce with plenty of fire from chilli, ginger and garlic. Try these healthy gluten free wraps. Super easy to make spring rolls recipe and are a great starter or party food. You can use any vegetables that you have about, just try to get a rainbow of colours – for a mixture of vitamins and because they look very appetising. The crunchy raw veggies and fruit are loaded with vitamins and minerals but this dish is very low calorie so only suitable for a snack or starter. In the winter I like to have something like this in place of a salad as when its cold eating raw veggie can be unappealing, but this dish is very tempting in cold weather. You can often pick up wrappers in an Asian shop very inexpensively and they’re great to have to make healthy wraps filled with fresh produce. The trick to easily using spring roll wrappers is only dip in warm water for a very short time. Take out before they become very soft. This is because they soften after being taken out of the water and too long in the water makes them very difficult to handle. Most recipes use meat and fried rolls but my healthy spring rolls are totally vegan and bursting with good nutrition with nothing harmful. 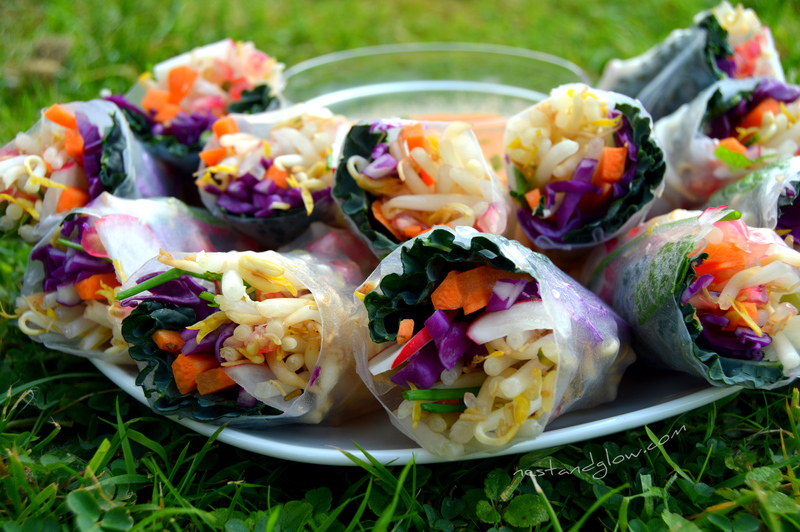 These winter rolls are naturally free in gluten as they are wrapped in spring roll wrappers. These can be known as rice paper or Vietnamese wrappers. The wraps are usually made out of mostly rice, with some tapioca and salt. They mainly have a carbohydrate taste and are low in nutrients but also calories with one containing about 23 calories. Check out my recipe for summer rolls, avocado veggie buns and fruit caramel rolls. Prepare all the winter roll fillings so that they are in small slices / strips that are suitable for the rolls. Dip a sheet of spring roll wrapper / rice paper in warm water for a few seconds. Then roll up like a burrito – roll over the filling, wrap in the sides and continue to roll to the end. See the video recipe for a demo. Slice the winter roll in half and place on serving dish. Put all of the raw sweet chilli sauce ingredients into a blender and then blend until smooth. Enjoy your healthy gluten free winter rolls immediately or store in the fridge where they will last for a day or so.